You find yourself going through copier sales and are considering the fastest options to get the jobs done that you need when you need it. One copier produces 80 prints per minute, while another option produces only 55. 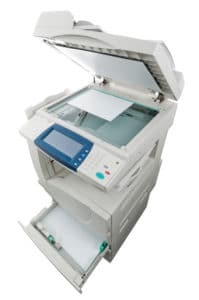 Many people think the first copier will always get the job done faster but that is not always the case.What most people do not consider is the warm-up time the copier needs before it can get started doing the print job. This is the time between when you put the paper to the glass, to when the copier spits out the first page. Are we doing a lot of very high volume printing that makes the faster printing worth it? Is this an office where copying is not especially common, and the warm-up time is costing valuable working hours? Is paying more for the faster copies worth the money over the slightly slower printer? Warm-up time affects productivity much more than print time for most offices. Nobody wants to be standing around waiting over a minute for a copier to warm-up for a small print job where print time is almost insignificant. At Albuquerque Copier we are committed to helping you see these factors that others may not share, because we want your copiers and printers to help your business thrive everyday.